Let’s re-think cars on our streets. The winning entry from the recent Toronto Complete Streets photo competition. Adam’s article on bike licensing has hit the nail on the head. Right wing councillors such as Junior Holyday™ and our own Ms. Nunziata are keen to have lower taxes and lower government intervention but only when it suits their own personal agendas. When it comes to protecting the status of cars and therefore their own personal travel times, bureaucratic expansion and government regulation are deemed to be essential tools, hence the suggestion to license bicycles, the most efficient mode of transportation ever invented. The only rationale offered seems to be that there are reckless cyclists who break the rules. As Adam has pointed out, scofflaw cyclists pose very little threat, unlike scofflaw drivers who check their messages, mascara, shave or have a meal while imposing their presence, air and noise pollution through the city. Motor vehicles are a hideous, expensive and dangerous blight on society and unfortunately, we have built our communities to the point where they are a necessary evil. Public transportation has been denied priority and is starved of funding so that it is slow, overcrowded and uncomfortable. Mayor John Tory’s idiotic request to the TTC for a 2.6% budget reduction speaks to the pervasive ‘cart before the horse’ mentality at City Hall. If Councillors Holyday, Nunziata and other like-minded representatives were forced to use public transportation in order to attend to their duties at City Hall, can you imagine how quickly the TTC would improve? 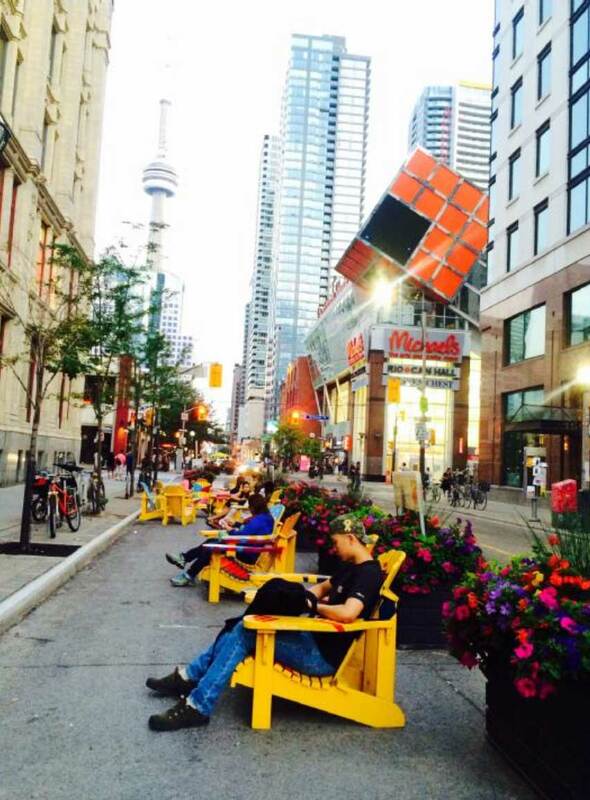 Amazingly, Toronto is the only major city in the world without a year-round pedestrian-only street. Think about it; that doesn’t happen accidentally. Similarly, in our own neck of the woods, Weston has no dedicated bike lanes on any of its streets. It’s largely thanks to our representatives who seem to be mentally stuck in an episode of Happy Days. 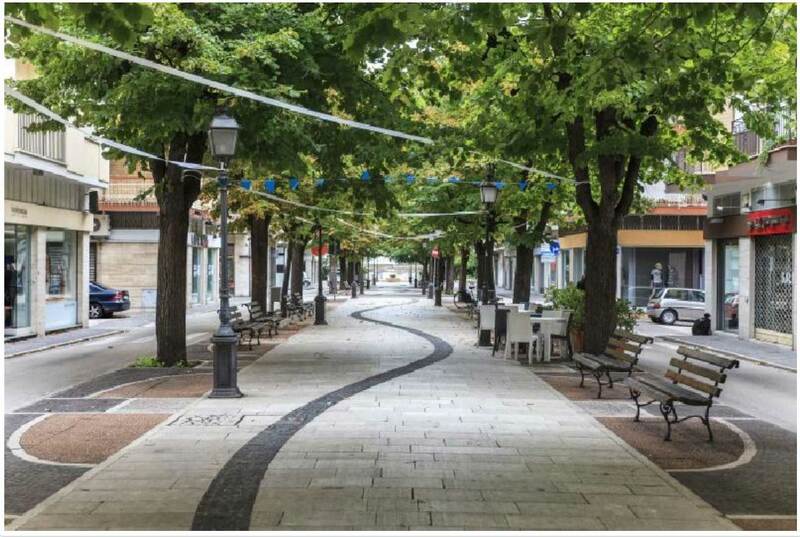 As the winning photo from the Complete Streets competition illustrates, cars spoil the environment in our cities. Unfortunately the photo was not taken in Toronto. It was taken in Porto San Giorgio, Italy. The second place photograph was taken in Toronto and looks pathetic in comparison. The other Toronto photographs are embarrassing in comparison to what is being achieved in major cities around the world. We have nothing remotely like the Italian example on any street in Toronto. The runner-up photograph, taken in Toronto is of a temporary art project on John Street downtown. Perhaps it’s time to acknowledge that cars have jumped the shark and that walking, bicycles and public transit are our future. Next Next post: How long is a bridge?